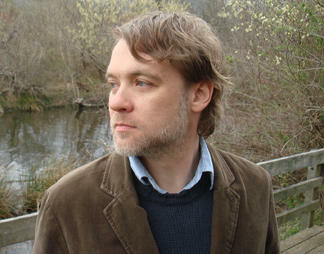 Morehead State University’s Department of English and the Kentucky Folk Art Center (KFAC) have announced poet Dr. Jesse Graves is the recipient of the 2013 Thomas and Lillie D. Chaffin Award for Appalachian Writing. A ceremony honoring Dr. Graves will be held at noon Friday, Oct. 4 at the Kentucky Folk Art Center. The author will read from his work and the public is invited to attend this free event. A question and answer session with the author will take place at Coffee Tree Books on Thursday, Oct. 3 at 2 p.m. The event is free and open to the public. A native of Sharps Chapel, Tenn., Dr. Graves is an assistant professor of English at East Tennessee State University. “Tennessee Landscape with Blighted Pine” is Graves’ first collection of poems and winner of the 2012 Weatherford Award in Poetry as well as the Poetry Book of the Year Award from the Appalachian Writers’ Association. “Tennessee Landscape with Blighted Pine is more than an extraordinary first book. These poems have the music, wisdom, and singular voice of a talent fully realized, and make abundantly clear that Jesse Graves is one of America’s finest young poets," said Chaffin Award winner, Ron Rash. Dr. Graves also was recognized for his poem, "Source," which won a Denny Plattner Award from the literary journal Appalachian Heritage in 2012. He co-edited The Southern Poetry Anthology, Volume III: Contemporary Appalachia, and Volume VI: Tennessee. His second poetry collection, Basin Ghosts, is forthcoming in Spring 2014 from Texas Review Press. The award, which includes a cash prize of $1,000, recognizes outstanding Appalachian writers in all genres. Past winners include Rash, Ann Pancake, Mark Powell, Diane Gilliam, Erik Reece, Sharon Hatfield, Ron Rash, John Sparks, Silas House, Chris Holbrook, Crystal Wilkinson and Denise Giardina. This event is sponsored by the English Department, Caudill College of Arts, Humanities and Social Sciences, MSU Arts and Humanities Council, the Corporation for Public Broadcasting and Morehead State Public Radio. Additional information is available by contacting MSU’s Department of English at 606-783-9448. Students interested in traveling the world and experiencing new cultures are invited to an informational session on overseas study opportunities at Morehead State University. The Study Abroad Fair will be held on Wednesday, Oct. 2, from 10 a.m. until 2 p.m. on the lawn of Allie Young, or if rain, it will be held in the main lobby of the Adron Doran University Center on the MSU campus. Interested students, faculty and staff can find information on the educational enrichment opportunities available globally through MSU’s Office of International Student Services. Are you a Morehead State University student, alum or community member and looking for full-time work, a part-time position or an internship? Are you considering graduate school or would you like to get your name out to employers? 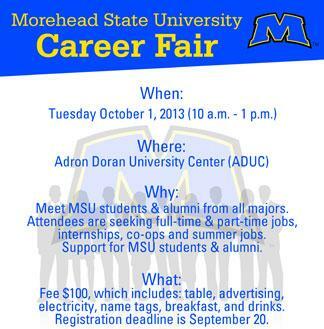 If so, the Fall Career Fair at MSU may be the opportunity for which you have been searching.